A well known Blogger.com blogging platform which is absolutely free its service. You can Creat a blog with blogger free of cost and you can share your thoughts with the world and spread your knowledge to your readers. Blogger was created in 1999 by co-founders Evan Williams and Meg Hourihan of the Pyra Labs Company. After four years Blogger was purchased by Google. What is Blogger Navigation Bar? When you create a new blog with blogger you find a Navbar (Navigation Bar) that appears by default at the top of your blog with default Blogger Template. Blogger Navbar sometimes very useful but hidden in third-party templates. This tutorial useful for only who are using the default blogger templates. Why people want to hide blogger navbar because their blog looks like a website and unique. Before disable or removal of blogger navbar you should know about it. It appears above and the top side of all Blogger and blogspot.com blogs to avail the different services. There is two kind of blogger navbar when you log in the blogger navbar changed and not looks like the first one according to services. There are several easy ways to remove blogger navbar. Let's discuss bellow. Find Navbar Gadget which is showing at the top right side. Select the option off and Hit the button save. 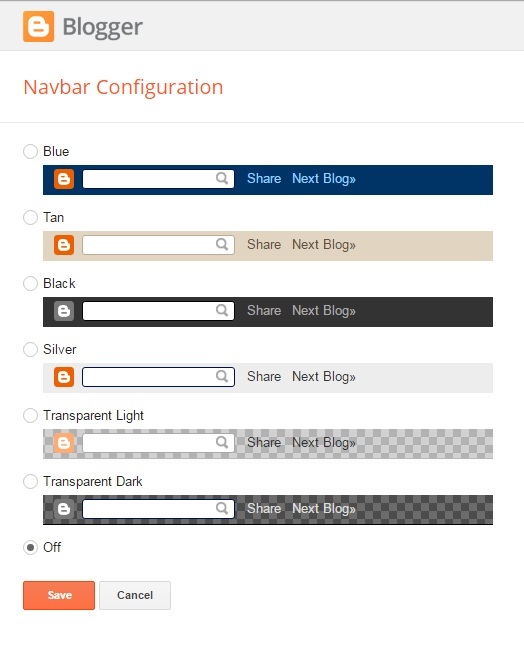 So this is a very simple way to disable and enable blogger navbar. Paste given Bellow code Just Before the Above Code That You Find. If you really want to remove blogger navbar gadget or widget from your blog you need to follow these simple steps. This is all the ways to remove blogger navbar from your blogger blog if you find the new way to remove or disable or hide the blogger navbar please feel free to share with me. If you need any help with removing the navbar feel free to contact me of comment bellow. If you are a simple guy who doesn't want to remove blogger navbar then you can find this bar very beneficial to you follow are some advantages and services of blogger navbar. There is an option to search the blog you are visiting. You Can share and promote a blog post on social media. See the Recent Updates of Blogger Blogs. After sign in you can find an extra option like dashboard etc.